Hi Y’all!! I am so thrilled to be here! While the wonderful Pam is moving, she asked me to fill in with a guest post. Yea!! I love her and her blog and am honored she asked. I’m Dionne of Glittery Fingers &Sparkling Toes! My blog is mainly a nail art blog, but with a twist. Every post I do comes with the tutorial on how to do the look and directions for both natural and acrylic nails! I feel there’s no reason why we can’t all do our nails J I do also review make up and other beauty products…but yep, mainly nails. I’m also a member of Metro Atlanta Beauty Bloggers, a homeschooling mom to a beautiful ballerina, my only two legged child. I also have two wonderful four legged kids, Japanese Chins, I’m married and I have a slightly obsessive obsession with Johnny Depp! This was a fun and easy mani to do and you don’t need any special tools. I started with two coats of China Glaze Beach Cruise-R. Once that dries, it’s time to start dotting. All you need are two different sized dots. Things you can use: a toothpick, a pen, a straight pin…anything that will make a dot. Then just start dotting. 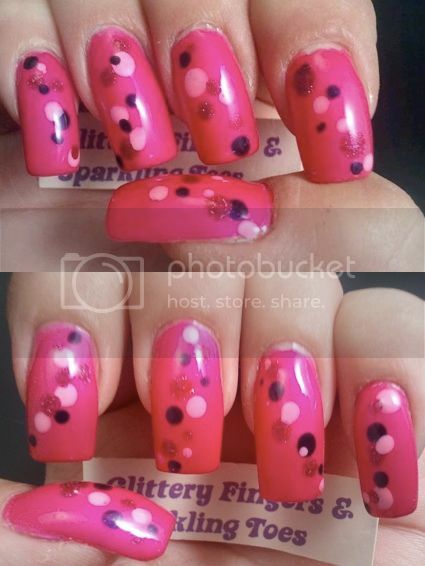 I made my dots in a kind of horizontal line with the ring finger’s line going the opposite way. But you can put the dots however you want. Just be careful not to do too many. Less is more with this design. And the directions are the same for natural and acrylic nails. I hope you had fun with today’s mani! I certainly had fun being here!! And here’s to hoping Pam gets back soon! Happy Polishing! !